Make the right impression on everyone with perfectly ironed clothes. Now, get crease free clothes with this steam iron from Panasonic, one of the trusted brands. It has the water tank of 200 ml, so if you want to sprinkle water while ironing, you can do it easily without having to run to fetch water separately. Make the right impression on everyone with perfectly ironed clothes. 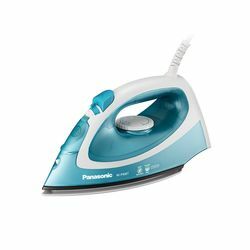 Now, get crease free clothes with this steam iron from Panasonic, one of the trusted brands. It has the water tank of 200 ml, so if you want to sprinkle water while ironing, you can do it easily without having to run to fetch water separately.